As an interior designer with a visual impairment Jacqui Smith has first-hand knowledge of the importance of good lighting and colour contrast and the difference they can make to a person’s confidence and independence. Join us for this CPD which will cover the principles of designing for people with sight loss with plenty of examples and opportunity for questions. Held at Southampton Solent University, attendees will leave with a deeper understanding of the importance of lighting and colours and how to take this into consideration when putting their design ideas into practice. You will also have the opportunity to network with other attendees over light refreshments. SBID members will gain 2 CPD points for attending this seminar. To attend, please email [email protected]. Jacqui Smith is the South East Regional Director. 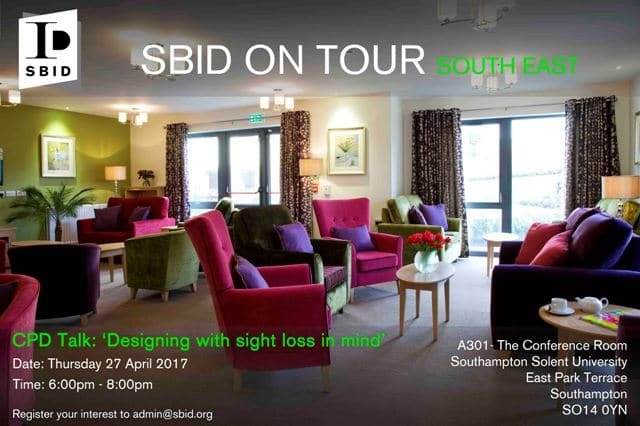 To keep up to date with SBID South East’s latest news and events please visit their Facebook page.